Game optimizations for Sniper Elite 4, For Honor, and Halo Wars 2. 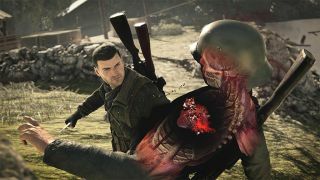 Nvidia today released a new Game Ready driver package containing performance tweaks and optimizations for three games: Sniper Elite 4, For Honor, and Halo Wars 2. The new driver, version 378.66, is WHQL certified and not a beta release. It's a relatively minor update in that it doesn't introduce any SLI profiles that weren't already included in prior 378 drivers, though it did add 3D compatibility mode profiles for Sniper Elite 4 and For Honor, both listed as "excellent." [Surround]: Surround cannot be enabled on the XGPU. [G-Sync]: With G-Sync and V-Sync both enabled, there is a long delay when switching a game from full-screen mode to windowed mode. [Second Life 64-bit]: World view is tinted blue after disabling Advanced Lighting Model. [The Division]: Shadows flicker after enabling PCSS. [Kepler GPUs][Battlefield 1]: There is flickering in the game when using TAA. [SLI][Surround][GeForce GTX 1080]: The system crashes when launching games in SLI Surround using HDMI 2.0 connections. [GeForce GTX 1080][Heroes of Storm]: The game crashes when launched. [GeForce 860M][Notebook]: Direct X games crash. [Minecraft]: Java SE Binary crashes pointing to nvinitx.dll. [GeForce GTX 980 Ti]: The driver is unable to detect multiple TV models. We have reviews of For Honor and Sniper Elite 4 in progress, so be sure to check those out. There's also an interesting write-up from Nvidia that covers PC-exclusive effects and features in For Honor. You can download Nvidia's newest Game Ready drivers package here.